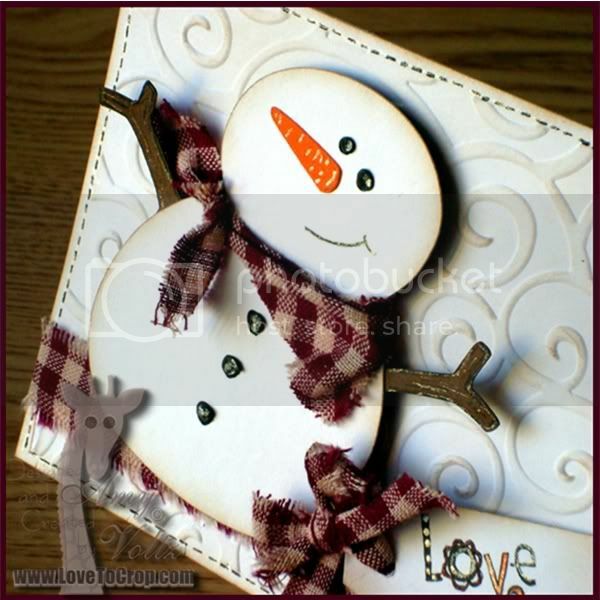 I just L-O-V-E this adorable snowman found on the Doodlecharms Cricut Cartridge -- He sure looks happy to spend his days in the blustery cold (Brrrr... Not me!!)... This little guy is cut at 3 inches (main layer from white and orange cardstock, blackout layer from brown cardstock). My white background was embossed with the Cuttlebug D'Vine Swirls embossing folder. I added SU! 's Creamy Caramel ink to the edges and over the swirls to "antique" it a bit before I heat set some black Liquid Applique for the eyes and buttons. A black pen and glitter pen created the mouth, texture on "arms", and stitching around the base. Love your card! The added texture of the fabric is awesome and the snowman is just too cute! Amy - This is beautiful. You used one of my favorite embossing sets. TFS. This is a fantastic card, one of the best I have seen in ages. Congratulations! Oh my gosh, your snowman is adorable. Love all the extra details, just awesome. 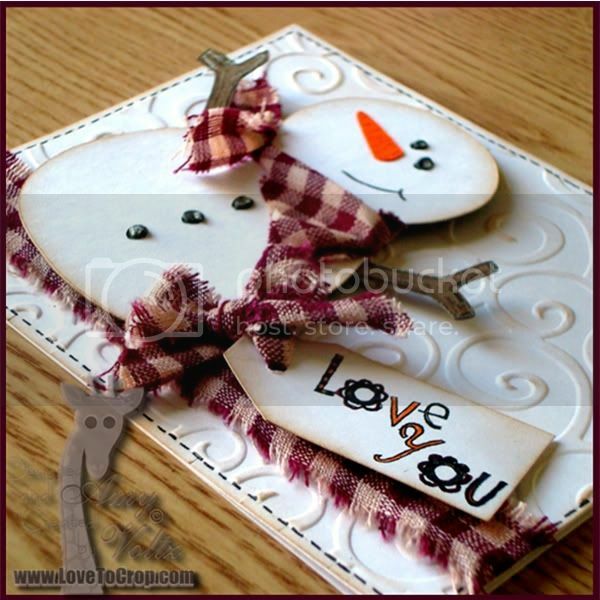 Especially like the homespun ribbon on your wonderful snowman card. Amy you rock. This is the cutest card! I love the "rustic" or "old country" feel you gave to it. Charming!!! LOVE THIS CARD!!! I probably will not be able to keep from scraplifting it:) BTW, thank you for all you to for the DT, you are awesome! Amazing card! I love the way you used the fabric. Amy, your card is totally adorable! I love the inking, embossing, and, of course, the ribbon. Just so darn cute. Thanks for the promo week links as well. Amy, Love it!! The snowman is tooooo cute!! Cute card! The ribbon really adds a great touch. Amy, your card is sooooo sweet! I love that snowman! Such a cute card Amy!!! I LOVE your darling snowman and that fabric-I SO want some!!! Love it!! What an absolutely adorable card! 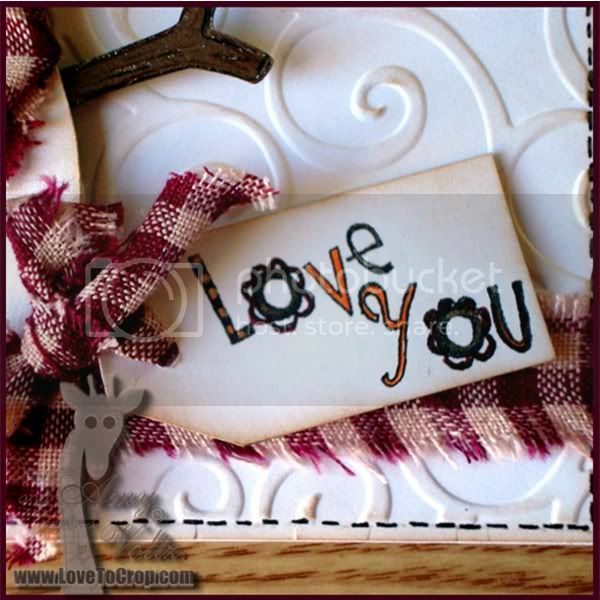 I love how you used fabric on your card and I love how you colored your sentiment! 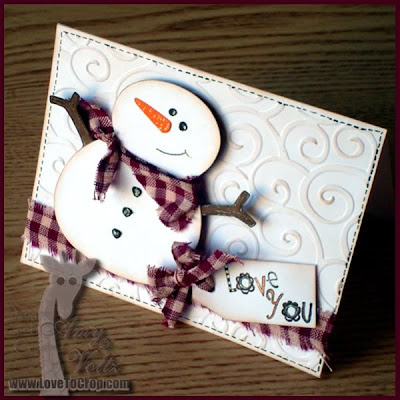 This snowman is just tooo cute, love the way you used the material!! Such a CUTE Snowman Amy!!! Love the inking that you've done! Fabulous work!!! Amy this is such a cute snowman, one of my favorites. The gingham ribbon is a perfect match for his awesome cute self! LOVE your snowman card! I saw it the first day and I swear I left a comment, but since I don't see it here...LOVE IT! That embossed card base and super adorable checked scarf make it so special! Amy this such a beautiful card! 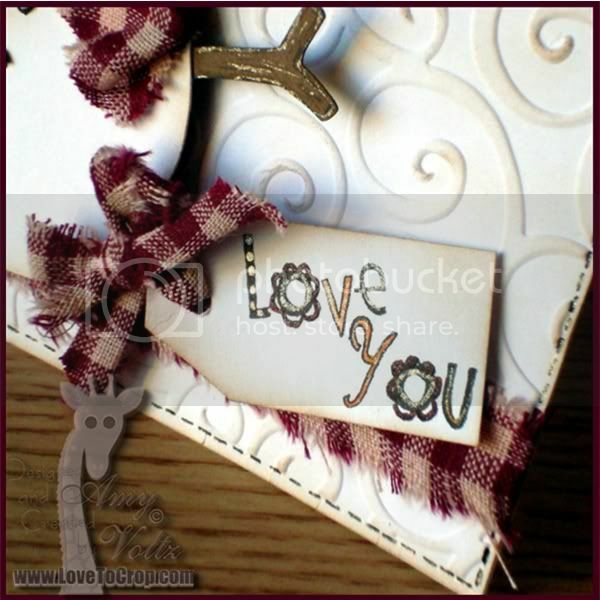 such a cute card and i love the homespun ribbon. it makes the card so homey.